The holidays are here again, which usually means gatherings over rich meals, potluck feasts at the office, dinners out, and a thousand other ways to indulge in the season’s sweet and savory treats. This can also be a time of added stress, family and social expectations, and less time to breathe deeply on your mat. Put all these things together and we have a pretty easy recipe for eating a little more than usual, and possibly ending up walking away from a dessert table more than comfortably full. Fortunately, if you have eaten a bit beyond your capacity, yoga can come to your rescue. Here are five yoga poses that help if you've eaten too much, moving things along and helping make you feel more comfortable. Come to lie flat on your back, with your knees bent and feet flat on the floor. Lift your hips and seat up, and move them to the right two inches. Rest your hips and seat back down, and allow your knees to drop to the right side. Turn your head to the left, pressing your left shoulder down into the ground. Take five to 10 deep breaths in this position, and then repeat to the other side. This will help encourage peristalsis, and will help move any trapped gasses out of your system, which can help relieve any pressure you may have built up in your abdomen. Come to lie flat on your belly, legs together, toes untucked. Place your hands beneath your shoulders, arms and elbows touching your side body. Your forehead down on the mat, imagine you have a piece of chalk taped to the very top center part of your head, which could reach the wall directly in front of you. As you inhale, begin to lift your head, neck and shoulders, first by extending the crown of your head forward, and then lifting as though you were going to draw a line with that chalk all the way up the length of the wall ahead of you to the ceiling. Use your back muscles to lift you, focusing on lengthening the spine as you lift. When you reach your fullest expression of the pose, stay for five to 10 breaths. 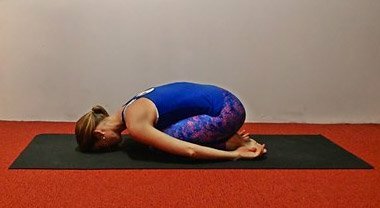 Breathing deeply while in this backbend gently massages your internal organs, which will help create space and move food through your system. This pose is one of my favorites if you are feeling bloated or overfull. Lie flat on your back and hug your knees into your chest. Take 10 to 20 deep, full breaths here and allow the pose to do its magic. The pressure of your legs against your belly will offer a gentle massage for your organs, which will feel awesome, and you will be encouraging any trapped wind to move out of your system. This pose works every similarly to Wind Relieving Pose. The only difference is that instead of hugging your knees into your chest, you will be opening your hips and legs to the side, reaching for the bottoms of your feet with your hands. This again is going to help create space in your abdomen and will encourage food and wind to move along your digestive system. Resting in Child’s Pose when you’re feeling overstuffed can be incredibly calming and soothing, as well as stimulating for the digestive system. As you lift your hips up above your heart, you will create an ideal alignment for trapped gasses to make their way out of your system. And as with many of the other poses mentioned here, this position will also create a nice massage for the internal organs, which will help stimulate peristalsis and intestinal movement—which is exactly what you want! Take 10 to 20 slow deep breaths in this position for best results. In all of these positions, as you rest, relax, and breathe deeply, you will be activating your parasympathetic nervous system, also known as your “rest and digest’ response. This is ideal when you are overfull, because you are essentially communicating to your body that you’re safe and that it can focus on house cleaning tasks and digestion. This means you will move your food through your system faster than you would if you were stressed, which will help you feel relief faster. Happy mindful holiday eating, my friends!